The internet has changed the way businesses operate, so it’s inevitable that your business will need to adapt digitally with the change of times. Businesses no longer rely on traditional advertising alone. It is essential for businesses to utilize the power of the internet by creating a website, business listings and social media pages. Businesses must expand their reach by utilizing services such as SEO also known as Search Engine Optimization. An internal Google study explained that businesses with an SEO-optimized website get 25-35% more clicks. With more customers going to your website, this may lead to an increase in foot traffic into your physical store. SEO improves your website’s presence on search engines such as Google. An SEO-optimized website will make it easier for your customers to find what they are looking for on your website as well as easily find information about your business. No matter the size of your business, SEO is an essential part of building your digital brand. An optimized website with content that is relevant to your customers will drive users to your website and may translate into foot traffic. Creating great content will attract visitors to your page. Add proper business information in your pages such as business addresses and contact numbers, so that visitors on your website will know where your business is located. Usually, business owners account a social media page such as a Facebook Business Page as an online website. While social media pages are useful, when someone is looking for your product or service online, Facebook pages are rarely the first result on a Google Search. Having a website and a social media page comes with several pros and cons. – Full Control over content. – Comments don’t have to be shown. – You have more credibility with a website. – More Information can be displayed. – Search engines will let relevant pages on your website appear on the first page of search results. – Content limited by what the service allows. – Comments cannot be controlled by yourself. Users can post reviews on your page. – You can interact with potential customers. – Facebook Pages only appear on Google when you search for the brand. 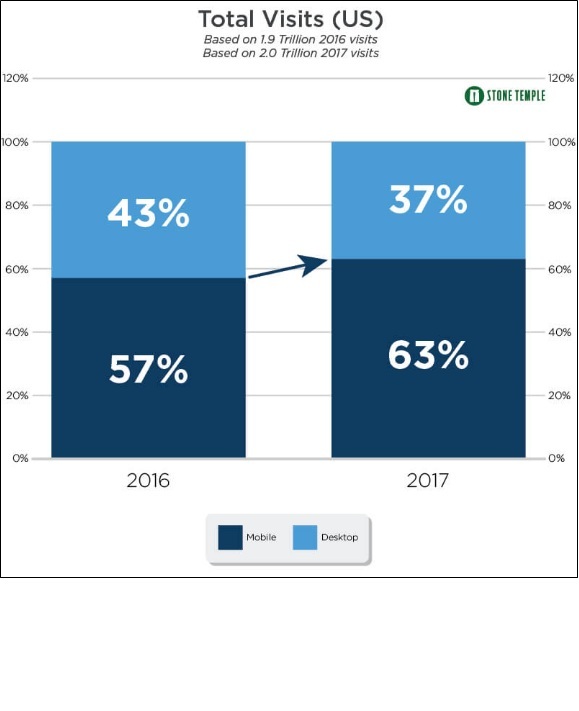 Since 2016, Mobile browsing has overtaken desktop browsing as the platform people use to access the internet. When your business is viewable on a mobile-friendly device then, users would have an easier time to get what they’re looking for. You want your business to be easily accessible which is why creating a mobile-friendly website should be a priority on your list. A recent study conducted by Hubspot discussed why having a mobile-friendly website is so important now. Majority of searches now come from smartphones and even more, users are convinced to do a store visit because of an optimized mobile website. 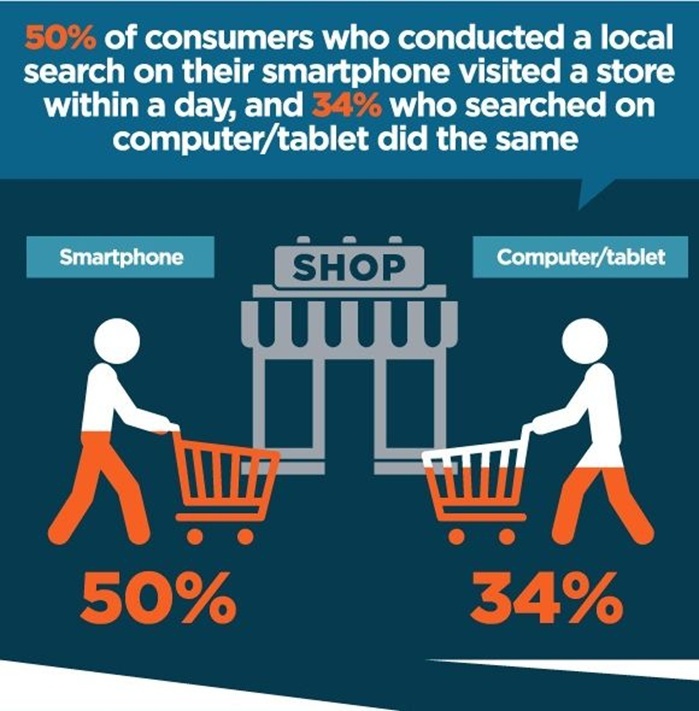 Compare the 50% of smartphone users and 34% of desktop/tablet users who visited a brick and mortar store on the image above. Having a mobile website helped convince the users to drop by the store which is why you want to cater to the majority of customers who are now always on mobile. Google does not penalize websites that are not mobile-friendly, but Google will prefer mobile-optimized pages and will indicate on the results page if a website is not mobile-friendly. To increase the visibility of local businesses, create or claim business listings on various services such as Google My Business, Bing, and Yahoo. By claiming the listings, your business will gain control of the business directory and you may enter all the necessary information of your business. For example, you own a Chinese restaurant and you want to attract visitors to your restaurant. Claiming business listings and providing the correct business information in the listing will help visitors and search engines identify where your Chinese restaurant operates. Now that your customers know where to find you and visit your shop, encourage your customers to drop a review of your shop. A regular purchase won’t result in any sort of review because it’s just another purchase. Make your customers feel special every time they drop by and they may leave a good word about you online through one of the business listings you have set up. Not only does Google see reviews as a good indicator of trust, but customers who are searching for your products and services as well. Another critical component that can help increase your foot traffic doesn’t necessarily start online. Talk to people. This may sound very basic but, in the end, you want to build a steady following that will visit your business all the time. Ask for help from your community by getting people to talk about you in this case. Get to know customers who have their own following to talk about your shop. Maintain a great experience for new and returning customers who visit your store and encourage them to leave a review or mention your website. Promote to customers upcoming events such as a sale or the launch of a new item in your store. When the customer talks about your shop online, they may feature your website on their blog or social media. You’ll be surprised that someone will drop by your store because of a small mention from your customers. Have your newsletter invite be the first item that appears when a potential customer visits your website. New customers interested in your products and services may be interested to learn about the latest promotions and newest information about your business. Newsletters are also a good way to keep your customers updated and learn information about your business ahead of everyone else. Business owners may utilize newsletters on advocacies, local community efforts, and other ways to show how the business is outreaching to the local community. Businesses don’t necessarily thrive on a one-time customer. To increase the foot traffic of your business, you want to create a cycle through SEO that will keep customers coming back. Start off by creating an optimized website with relevant content for your customers. Keep all the business information consistent on all of your business listings such as Google My Business, Yelp, etc. Make sure your website is optimized for the schema to have search results to identify the business information on your website. Talk to your customers. Get to know them and always provide a great experience when they purchase something. This will encourage and incentivize your customers to be advocates of your brand and leave reviews, mention you online, and even promote you through word of mouth. With positive reviews, customers view these as a measure of trust, and you may find yourself a new batch of customers. With these tips, repeat these best practices and you should drive more foot traffic to your business. Dan Smink is the founder of C1 Partners, a Denver SEO company that helps small to medium enterprises with their digital marketing strategy. Dan comes from a background of 20 years in business leadership and has a track record of helping businesses achieve million dollar revenue values. He is an active community leader and a contributor to the Forbes.com's Agency Council spreading the word on how many digital strategies can make a positive impact on today's businesses. You may connect with him on LinkedIn.